Receive Tax Benefits for Your Car Donation NY, and More! Should Your Child Be Eating Foods Containing GMOs? If you, or someone has a vehicle to donate, in NY, NJ or any other state, and would like to help us help kids with cancer, please click here. let you decide for yourself. Because children’s bodies go through rapid growth development, scientists utilyzed young rats in an independent GMO study. Besides breakfast cereals, snacks, pizza, and much more, GMOs are hidden in many food products that you assumed were perfectly healthy for your children. You may have heard that there are studies demonstrating GMOs are safe. You should know that two major ones have been retracted. 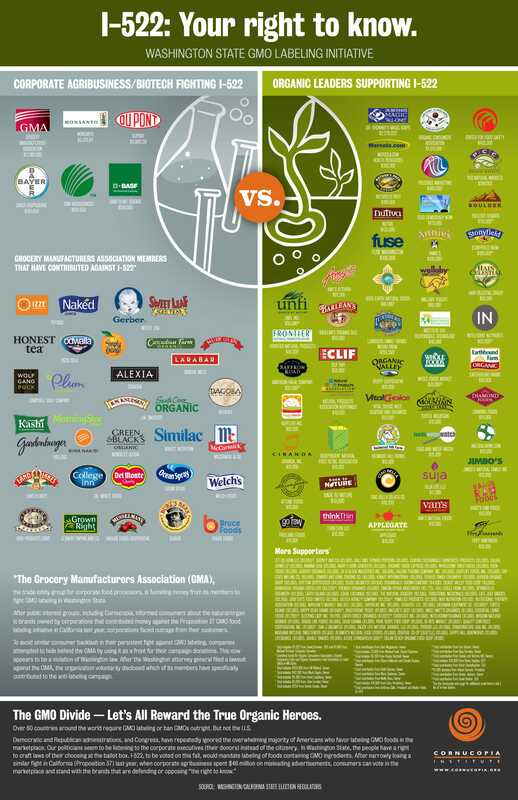 A graphic showing the so called “health” foods that either contain GMOs, or are owned by corporations that fund campaigns to resist GMO labeling. Whatever your conclusions you’ve drawn from the above information: if there’s any doubt at all remaining about possible long-term toxicity in these foods, why would we feed them to our children? It’s one thing to gamble with our own health, but the developing bodies of children, who are more susceptible to food and other environmental toxins, is another matter. This entry was posted in Alternative Cancer Treatments, Car Donation NJ, Car Donation NY, Uncategorized on May 27, 2014 by Alex Streeter. In case you don’t know this, that less than perfect car sitting around in your garage (or yard) for ages, can be donated to help very worthy causes. Donating your old car to a nonprofit organization will not only give you some free space you’ll make better use of, it will also assist a worthy organization like American Children’s Cancer Association (ACCA), educationally support families with kids with cancer determine the safest, most effective treatments. for anybody to use? Does it need to be in working order? Ideally, of course, the vehicle should run. But generally, car donation charities will accept it, running or not. 2. If it doesn’t start, it may still be able to be used/sold for parts or metal. 3. Absolute requirement: The car must have a title. If you don’t have it, ACCA may be able to help you obtain it. 4. Car cannot have lien holders; the car must be owned by the donator, outright. 5. We take all kinds of vehicles; cars, trucks Vans, RVs, SUVs, motocycles, even boats and planes. 6. ACCA will take care of towing your car to us — free. ACCA also offers great thank you gifts. You’ll also receive a tax benefit. Please see website for details. For New Jersey car donations, click here. For New York Car Donations, click here. For all other states, click here. For additional information,please check out this page. This entry was posted in Uncategorized on May 20, 2014 by Alex Streeter. How To Feed Your Child, Healthy Organic Food — On A Budget! To Donate Your Car NJ, truck or other vehicle, (in NJ, NY or any other state) please click here! It IS Possible to Feed Your Children the BEST Foods, on a Budget! Imagine how great it would be if you never ingested, inhaled or slathered anything toxic in or on your body? No pollution, fluoride, trans-fats, artificial dyes, gmo foods, etc. etc.? Never smoked, excessively drank, or did anything else that insulted your body? Consider for a moment how wonderful it would be if your body was clean and toxin-free? Whether your children are currently healthy, or struggling with an illness, it’s never too late to begin making certain everything they consume, have applied or wear, are as pure and natural as possible… so they can enjoy much of the above toxin-free kind of life. The earlier you start your child on a diet of natural, organic, non-processed, non-sugary foods, the sooner they will adapt to them. If they are already hooked on Fruit Loops and the like, you can gradually wean them off such artificial “foods”, and slowly introduce far superior, nutrient-rich foods. This will not only keep them healthy (by strengthening their immune systems, etc.) it will also assist their bodies in the healing of any health challenges. Also: Feed Your Toddler (and young kids) Some Super-Foods! (it costs 99 cents to view full documentary). If you have Amazon prime, you can see it free, here. To see similar information for free, click here. Monsanto is a multi-national corporation that is destroying our food supply with highly toxic pesticides, genetic modification of food plants, and their insidious patenting of seeds. that buying healthy, organic food too expensive. plant covering on them, that protects its florets and stems from pesticides. For more information on the above, PLUS the foods you MUST buy as organic, please click here. And finally, if you give your children milk: please consider whole pasteurized goat milk, as opposed to cow’s milk. It generaly is digested much better. There is also nut and other alternative “milks” (such as almond, rice and coconut) that your children may like. But please consider only buying the non- sweetened varieties, and if necessary for taste, adding Stevia as a natural, safe sweetener, to them. Best of success with your pursuit of a safe, natural and very healthy lifestyle, from the American Children’s Cancer Association! Through the funds we receive from Car Donation NY and Ca Donation NJ (and all other states), we help kids with cancer (and their families) determine the best treatment options! This entry was posted in Alternative Cancer Treatments, donate your car nj, Healthy Foods on May 11, 2014 by Alex Streeter. Click Here to Make Your Car Donation NY Today! in New York City and New York state (as well as New jersey, and all other states). If you live in NY, and would like to donate your car NY, truck, plane or any other vehicle (or real estate or cash) we suggest you take advantage of this opportunity! cancer treatments for their child. b. Once the best treatment options are found, we help the families pay for them. (we offer the most generous thank you gifts among car donation charities). a voucher for a free 3 day, 2 night vacation (multiple locations to choose from). 4. You’ll receive fast, free towing for your donated vehicle! 5.When you make your car donation NY, you’ll receive tax benefits. thank you gifts and other benefits (listed above) that ACCA offers. over 15 years, and is an approved, 501(c)(3) charity. *Please see these requirements to receive the $200 VISA Gift Card. This entry was posted in Alternative Cancer Treatments, Car Donation NY, Car Donation NYC, Donate Car NY, Donate Car NYC, Donate Your Car NY, Donate Your Car NYC and tagged Car Donation NY, Car Donation NYC, Donate Car NY, Donate Car NYC, Donate Your Car NY, Donate Your Car NYC on May 8, 2014 by Alex Streeter.